Once again, I’ve gone dark for an extended period of time. But this time I have a good reason – I’ve been working on a special surprise* for all my blog readers (assuming you guys are still out there). My special surprise was inspired by a need for a new project. For a long time on this blog, I talked a lot about getting the Ultimate Hard Body, and I put all my energy into accomplishing that goal. 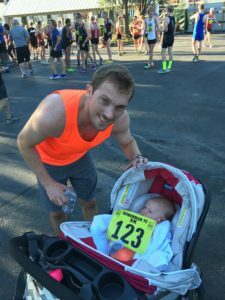 I ran a bunch of races – including a couple of marathons, I joined three hundred gyms and went to five thousand work out classes, and entered a fitness competition where I placed poorly but pretty much got the Ultimate Hard Body. Right now you’re probably thinking, “Wow, I can’t believe you accomplished all of your life goals in your late 20s, you must be retired now and spending all of your days watching Netflix and eating cookies and doing absolutely nothing else.” This is actually only half true. Despite all of my success, I decided to reach even higher, which is why, after getting the Ultimate Hard Body, I decided to go double or nothing and grow another Ultimate Hard Body. The only hiccup here is that while I definitely succeeded in growing a brand new “Ultimate Body,” it is not “Hard” at all. In fact, it’s the squishiest little body I’ve ever seen. The Hard part of this project might actually totally backfire. That would be step two, and really it’s up to the new little body to decide if she wants to do that part or not, so it’s out of my hands now. Obviously I’m trying to let her know that option’s available, but so far she is pretty resistant to most things running/workout related. Ex. 1: Got her all dressed up in running gear, thought that would motivate her. Instead, she furled up her arms and legs and wriggled around a little and went to sleep. That’s not even any kind of sport! 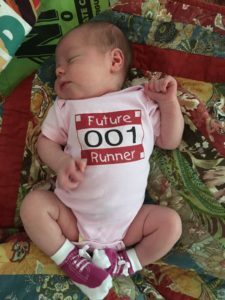 I guess I should have found a onesie that said “Current Runner” instead. Ex. 2: I wanted to teach her that she needs to foam roll to prevent injury so she can focus on her running. She definitely gets bonus points for being conscious here, but what is she trying to foam roll? Her forearms?? 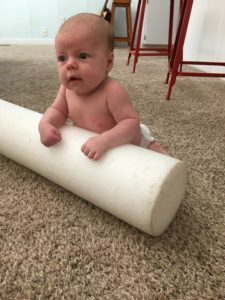 Baby, your IT bands are going to be so tight, you need to start rolling them out now! Ex. 3: Took her to do a track workout. This picture pretty much sums up how much effort she put into it (NONE). Ex. 4: Okay, maybe she actually needs to go run a race to get excited about all of this. Oh wait, you say you’re a baby and need to be pushed around in a cart and won’t even get out and stand up? This kind of attitude does not bode well. I guess at this point I should mention that I had some help on this project, from the guy in this picture that you may remember from this post, among others, if you are a long-time reader. It looks like for now I need to forget about this little squishy baby and focus on what I focus on best: me. 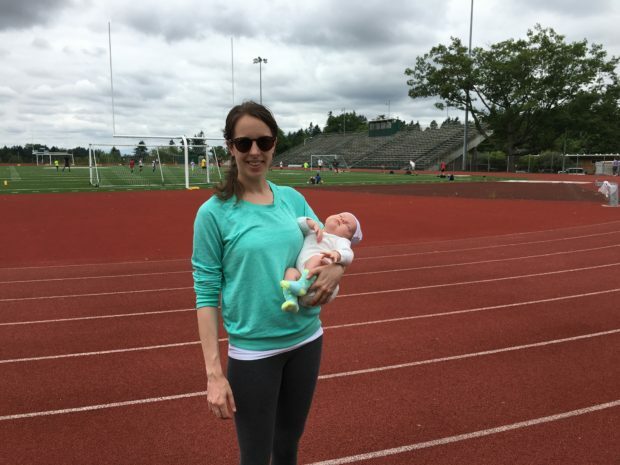 And this is the good news – after growing this little baby body, my body has become equally squishy, so I have plenty to keep me busy. 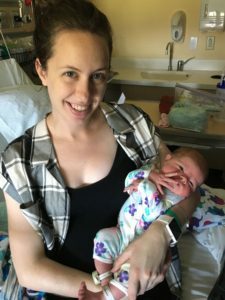 I have a lot to tell you about trying to keep my UHB during and after the growth of this new little baby body (spoiler alert: it didn’t work), hopefully the little baby doesn’t hog too much of my time so I can be sure to fill you in. *I realize at this point this probably isn’t much of a special surprise to anyone reading this, but the little baby body keeps yelling at me every time I try to blog, so it took like two months to write this blog post.